William "Count" Basie (August 21, 1904 - April 26, 1984) was an American jazz pianist, organist, bandleader, and composer. His mother first taught him piano and he started performing in his teens. Dropping out of school, he learned to operate lights for vaudeville and to improvise accompaniment for silent films at a local movie theater in his town of Red Bank, New Jersey. By 16, he increasingly played jazz piano at parties, resorts and other venues. In 1924, he went to Harlem, where his performing career expanded; he toured with groups to the major jazz cities of Chicago, St. Louis and Kansas City. In 1929 he joined Bennie Moten's band in Kansas City, and played with them until Moten's death in 1935. That year Basie formed his own jazz orchestra, and in 1936 took them to Chicago for a long engagement and their first recording. He led the group for almost 50 years, creating innovations like the use of two "split" tenor saxophones, emphasizing the rhythm section, riffing with a big band, using arrangers to broaden their sound, and others. Many notable musicians came to prominence under his direction, including the tenor saxophonists Lester Young and Herschel Evans, the guitarist Freddie Green, trumpeters Buck Clayton and Harry "Sweets" Edison and singers Jimmy Rushing and Joe Williams. Basie's theme songs were "One O'Clock Jump," developed in 1935 in the early days of his band, and "April In Paris". Biography edit: Early life and education edit: William Basie was born to Harvey Lee and Lillian Basie in Red Bank, New Jersey. His father worked as a coachman and caretaker for a wealthy judge. After automobiles replaced horses, his father became a groundskeeper and handyman for several wealthy families in the area. Both of his parents had some type of musical background. His father played the mellophone, and his mother played the piano; in fact, she gave Basie his first piano lessons. She took in laundry and baked cakes for sale for a living. She paid 25 cents a lesson for piano instruction for him. Not much of a student in school, Basie dreamed of a traveling life, inspired by touring carnivals which came to town. He finished junior high school but spent much of his time at the Palace Theater in Red Bank, where doing occasional chores gained him free admission to performances. He quickly learned to improvise music appropriate to the acts and the silent movies. Though a natural at the piano, Basie preferred drums. Discouraged by the obvious talents of Sonny Greer, who also lived in Red Bank and became Duke Ellington's drummer in 1919, Basie at age 15 switched to piano exclusively. Greer and Basie played together in venues until Greer set out on his professional career. By then, Basie was playing with pick-up groups for dances, resorts, and amateur shows, including Harry Richardson's "Kings of Syncopation". When not playing a gig, he hung out at the local pool hall with other musicians, where he picked up on upcoming play dates and gossip. He got some jobs in Asbury Park at the Jersey Shore, and played at the Hong Kong Inn until a better player took his place. Early career edit: Around 1928, Basie went to Harlem, a hotbed of jazz, where he lived down the block from the Alhambra Theater. Early after his arrival, he bumped into Sonny Greer, who was by then the drummer for the Washingtonians, Duke Ellington's early band. Soon, Basie met many of the Harlem musicians who were "making the scene," including Willie "the Lion" Smith and James P. Johnson. Basie toured in several acts between 1925 and 1927, including Katie Krippen and Her Kiddies as part of the Hippity Hop show; on the Keith, the Columbia Burlesque, and the Theater Owners Bookers Association (T.O.B.A.) vaudeville circuits; and as a soloist and accompanist to blues singers Katie Krippen and Gonzelle White. His touring took him to Kansas City, St. Louis, New Orleans, and Chicago. Throughout his tours, Basie met many great jazz musicians, including Louis Armstrong. Before he was 20 years old, he toured extensively on the Keith and TOBA vaudeville circuits as a solo pianist, accompanist, and music director for blues singers, dancers, and comedians. This provided an early training that was to prove significant in his later career. Back in Harlem in 1925, Basie got his first steady job at Leroy's, a place known for its piano players and its "cutting contests." The place catered to "uptown celebrities," and typically the band winged every number without sheet music (using "head arrangements"). He met Fats Waller, who was playing organ at the Lincoln Theater accompanying silent movies, and Waller taught him how to play that instrument. (Basie later played organ at the Eblon Theater in Kansas City). As he did with Duke Ellington, Willie "the Lion" Smith helped Basie out during the lean times by arranging gigs at "house-rent parties," introducing him to other top musicians, and teaching him some piano technique. In 1928 Basie was in Tulsa and heard Walter Page and his Famous Blue Devils, one of the first big bands, which featured Jimmy Rushing on vocals. A few months later, he was invited to join the band, which played mostly in Texas and Oklahoma. It was at this time that he began to be known as "Count" Basie (see Jazz royalty). Kansas City years edit: The following year, in 1929 Basie became the pianist with the Bennie Moten band based in Kansas City, inspired by Moten's ambition to raise his band to the level of Duke Ellington's or Fletcher Henderson's. Where the Blue Devils were "snappier" and more "bluesy," the Moten band was classier and more respected, and played in the "Kansas City stomp" style. In addition to playing piano, Basie was co-arranger with Eddie Durham, who notated the music. During a stay in Chicago, Basie recorded with the band. He occasionally played four-hand piano and dual pianos with Moten, who also conducted. The band improved with several personnel changes, including the addition of tenor saxophonist Ben Webster. When the band voted Moten out, Basie took over for several months, calling the group "Count Basie and his Cherry Blossoms." When his own band folded, he rejoined Moten with a newly re-organized band. When Moten died in 1935 after a surgical procedure, the band unsuccessfully tried to stay together but couldn't make a go of it. Basie formed a new band that year, which included many Moten alumni, with the important addition of tenor player Lester Young. They played at the Reno Club and sometimes were broadcast on local radio. Late one night with time to fill, the band started improvising. Basie liked the results and named the piece "One O'Clock Jump." According to Basie, "we hit it with the rhythm section and went into the riffs, and the riffs just stuck. We set the thing up front in D-flat, and then we just went on playing in F." It became his signature tune. John Hammond and first recordings edit: At the end of 1936, Basie and his band, now billed as "Count Basie and His Barons of Rhythm," moved from Kansas City to Chicago, where they honed their repertoire at a long engagement at the Grand Terrace Ballroom. Right from the start, Basie's band was noted for its rhythm section. Another Basie innovation was the use of two tenor saxophone players; at the time, most bands had just one. When Young complained of Herschel Evans' vibrato, Basie placed them on either side of the alto players, and soon had the tenor players engaged in "duels". Many other bands later adapted the split tenor arrangement. In that city in October 1936, the band had a recording session which the producer John Hammond later described as "the only perfect, completely perfect recording session I've ever had anything to do with". Hammond had heard Basie's band over short-wave radio and went to Kansas City to check them out. He invited them to record, in performances which were Lester Young's earliest recordings. Those four sides were released under the band name of Jones-Smith Incorporated; the sides were "Shoe Shine Boy", "Evening", "Boogie Woogie", and "Oh, Lady Be Good". Basie had already signed with Decca Records, but did not have his first recording session with them until January 1937. By then, Basie's sound was characterized by a "jumping" beat and the contrapuntal accents of his own piano. His personnel around 1937 included: Lester Young and Herschel Evans (tenor sax), Freddie Green (guitar), Jo Jones (drums), Walter Page (bass), Earle Warren (alto sax), Buck Clayton and Harry Edison (trumpet), Benny Morton and Dickie Wells (trombone). Lester Young, known as "Prez" by the band, came up with nicknames for all the other band members. He called Basie "Holy Man", "Holy Main", and just plain "Holy". Basie favored blues, and he would showcase some of the most notable blues singers of the era after he went to New York: Billie Holiday, Jimmy Rushing, Big Joe Turner, Helen Humes, and Joe Williams. He also hired arrangers who knew how to maximize the band's abilities, such as Eddie Durham and Jimmy Mundy. New York City and the swing years edit: When Basie took his orchestra to New York in 1937, they made the Woodside Hotel in Queens their base (they often rehearsed in its basement). Soon, they were booked at the Roseland Ballroom for the Christmas show. Basie recalled a review, which said something like, "We caught the great Count Basie band which is supposed to be so hot he was going to come in here and set the Roseland on fire. Well, the Roseland is still standing". Compared to the reigning band of Fletcher Henderson, Basie's band lacked polish and presentation. The producer John Hammond continued to advise and encourage the band, and they soon came up with some adjustments, including softer playing, more solos, and more standards. They paced themselves to save their hottest numbers for later in the show, to give the audience a chance to warm up. His first official recordings for Decca followed, under contract to agent MCA, including "Pennies from Heaven" and "Honeysuckle Rose". Hammond introduced Basie to Billie Holiday, whom he invited to sing with the band. (Holiday didn't record with Basie, as she had her own record contract and preferred working with small combos). The band's first appearance at the Apollo Theater followed, with the vocalists Holiday and Jimmy Rushing getting the most attention. Durham returned to help with arranging and composing, but for the most part, the orchestra worked out its numbers in rehearsal, with Basie guiding the proceedings. There were often no musical notations made. Once the musicians found what they liked, they usually were able to repeat it using their "head arrangements" and collective memory. Next, Basie played at the Savoy, which was noted more for jitterbugging, while the Roseland was a place for fox-trots and congas. In early 1938, the Savoy was the meeting ground for a "battle of the bands" with Chick Webb's group. Basie had Holiday, and Webb countered with the singer Ella Fitzgerald. As Metronome magazine proclaimed, "Basie's Brilliant Band Conquers Chick's"; the article described the evening: "Throughout the fight, which never let down in its intensity during the whole fray, Chick took the aggressive, with the Count playing along easily and, on the whole, more musically scientifically. Undismayed by Chick's forceful drum beating, which sent the audience into shouts of encouragement and appreciation and casual beads of perspiration to drop from Chick's brow onto the brass cymbals, the Count maintained an attitude of poise and self-assurance. He constantly parried Chick's thundering haymakers with tantalizing runs and arpeggios which teased more and more force from his adversary". The publicity over the big band battle, before and after, gave the Basie band a boost and wider recognition. Soon after, Benny Goodman recorded their signature "One O'Clock Jump" with his band. A few months later, Holiday left for Artie Shaw's band. Hammond introduced Helen Humes, whom Basie hired; she stayed with Basie for four years. When Eddie Durham left for Glenn Miller's orchestra, he was replaced by Dicky Wells. Basie's 14-man band began playing at the Famous Door, a mid-town nightspot with a CBS network feed and air conditioning. Their fame took a huge leap. Adding to their play book, Basie received arrangements from Jimmy Mundy (who had also worked with Benny Goodman and Earl Hines), particularly for "Cherokee", "Easy Does It", and "Super Chief". In 1939, Basie and his band made a major cross-country tour, including their first West Coast dates. A few months later, Basie quit MCA and signed with the William Morris Agency, who got them better fees. On the West Coast, in 1942 the band did a spot in Reveille With Beverly, a musical film starring Ann Miller, and a "Command Performance" for Armed Forces Radio, with Hollywood stars Clark Gable, Bette Davis, Carmen Miranda, Jerry Colonna, and the singer Dinah Shore. Other minor movie spots followed, including Choo Choo Swing, Crazy House, Top Man, and Hit Parade of 1943. They also started to record with RCA. The war years caused a lot of members turn over, and the band worked many play dates with lower pay. Dance hall bookings were down sharply as swing began to fade, the effects of the musicians' strikes of 1942-44 and 1948 began to be felt, and the public's taste grew for singers. Basie occasionally lost some key soloists. However,throughout the 1940s, Basie maintained a big band that possessed an infectious rhythmic beat, an enthusiastic team spirit, and a long list of inspired and talented jazz soloists. Marriage and family edit: Basie is a member of Omega Psi Phi Fraternity. He married Catherine Morgan in the late 1930s. In 1942, they moved to Queens. On April 11, 1983, Catherine Basie died of a heart attack at the couple's home in Freeport, Grand Bahama Island. She was 67 years old. Post-war and later years edit: The big band era appeared to have ended after the war, and Basie disbanded the group. For a while, he performed in combos, sometimes stretched to an orchestra. In 1950, he headlined the Universal-International short film "Sugar Chile" Robinson, Billie Holiday, Count Basie and His Sextet. He reformed his group as a 16-piece orchestra in 1952. Basie credits Billy Eckstine, a top male vocalist of the time, for prompting his return to Big Band. He said that Norman Granz got them into the Birdland club and promoted the new band through recordings on the Mercury, Clef, and Verve labels. The jukebox era had begun, and Basie shared the exposure along with early rock'n'roll and rhythm and blues artists. Basie's new band was more of an ensemble group, with fewer solo turns, and relying less on "head" and more on written arrangements. Basie added touches of bebop "so long as it made sense", and he required that "it all had to have feeling". Basie's band was sharing Birdland with such bebop greats as Charlie Parker, Dizzy Gillespie, and Miles Davis. Behind the occasional bebop solos, he always kept his strict rhythmic pulse, "so it doesn't matter what they do up front; the audience gets the beat". Basie also added flute to some numbers, a novelty at the time that became widely copied. Soon, his band was touring and recording again. The new band included: Paul Campbell, Tommy Turrentine, Johnny Letman, Idrees Sulieman, and Joe Newman (trumpet); Jimmy Wilkins, Benny Powell, Matthew Gee (trombone); Paul Quinichette and Floyd "Candy" Johnson (tenor sax); Marshall Royal and Ernie Wilkins (alto sax); and Charlie Fowlkes (baritone sax).Down Beat magazine reported, "(Basie) has managed to assemble an ensemble that can thrill both the listener who remembers 1938 and the youngster who has never before heard a big band like this." In 1958, the band made its first European tour. Jazz was especially appreciated in France, The Netherlands, and Germany in the 1950s; these countries were the stomping grounds for many expatriate American jazz stars who were either resurrecting their careers or sitting out the years of racial divide in the United States. Neal Hefti began to provide arrangements, notably "Lil Darlin'". By the mid-1950s, Basie's band had become one of the preeminent backing big bands for some of the most prominent jazz vocalists of the time. They also toured with the "Birdland Stars of 1955", whose lineup included Sarah Vaughan, Erroll Garner, Lester Young, George Shearing, and Stan Getz. In 1957, Basie released the live album Count Basie at Newport. "April in Paris" (arrangement by Wild Bill Davis) was a best-selling instrumental and the title song for the hit album. The Basie band made two tours in the British Isles and on the second, they put on a command performance for Queen Elizabeth II, along with Judy Garland, Vera Lynn, and Mario Lanza. He was a guest on ABC's The Pat Boone Chevy Showroom, a venue also opened to several other black entertainers. In 1959, Basie's band recorded a "greatest hits" double album The Count Basie Story (Frank Foster, arranger) and "Basie and Eckstine, Inc.": album featuring Billy Eckstine, Quincy Jones (as arranger) and the Count Basie Orchestra. It was released by Roulette Records, then later reissued by Capital Records. Later that year, Basie appeared on a television special with Fred Astaire, featuring a dance solo to "Sweet Georgia Brown", followed in January 1960 by Basie performing at one of the five John F. Kennedy Inaugural Balls. That summer, Basie and Duke Ellington combined forces for the recording First Time! The Count Meets the Duke, each providing four numbers from their play books. During the balance of the 1960s, the band kept busy with tours, recordings, television appearances, festivals, Las Vegas shows, and travel abroad, including cruises. Some time around 1964, Basie adopted his trademark yachting cap. Through steady changes in personnel, Basie led the band into the 1970s. Basie made a few more movie appearances, such as the Jerry Lewis film Cinderfella (1960) and the Mel Brooks movie Blazing Saddles (1974), playing his arrangement of "April in Paris". Basie died of pancreatic cancer in Hollywood, Florida on April 26, 1984 at the age of 79. Count Basie and his Orchestra edit: The musicians associated with Count Basie over the years included the following: c.1937: Joe Keyes, Buck Clayton, Carl Smith, George Hunt, Dan Minor, Caughey Roberts, Herschel Evans, Lester Young, Jack Washington, Claude Williams, Walter Page, Jo Jones., c.1939: Ed Lewis, Buck Clayton, Shad Collins, Harry Edison, Earle Warren, Buddy Tate, Benny Morton, Dicky Wells, Freddie Green., 1940: Al Killian, Vic Dickenson., 1943: Joe Newman, Snooky Young, Eli Robinson, Robert Scott, Jimmy Powell, Rudy Rutherford, Rodney Richardson., The singers edit: Basie hitched his star to some of the most famous vocalists of the 1950s and 1960s, which helped keep the Big Band sound alive and added greatly to his recording catalog. Jimmy Rushing sang with Basie in the late 1930s. Joe Williams toured with the band and was featured on the 1957 album One O'Clock Jump, and 1956's Count Basie Swings, Joe Williams Sings, with "Every Day (I Have the Blues)" becoming a huge hit. With Billy Eckstine on the album Basie-Eckstine Inc., in 1959. Ella Fitzgerald made some memorable recordings with Basie, including the 1963 album Ella and Basie!. With the 'New Testament' Basie band in full swing, and arrangements written by a youthful Quincy Jones, this album proved a swinging respite from her Songbook recordings and constant touring she did during this period. She even toured with the Basie Orchestra in the mid-1970s, and Fitzgerald and Basie also met on the 1979 albums A Classy Pair, Digital III at Montreux, and A Perfect Match, the last two also recorded live at Montreux. In addition to Quincy Jones, Basie was using arrangers such as Benny Carter (Kansas City Suite), Neal Hefti (The Atomic Mr Basie), and Sammy Nestico (Basie-Straight Ahead). Frank Sinatra recorded for the first time with Basie on 1962's Sinatra-Basie and for a second studio album on 1964's It Might as Well Be Swing, which was arranged by Quincy Jones. Jones also arranged and conducted 1966's live Sinatra at the Sands which featured Sinatra with Count Basie and his orchestra at the Sands Hotel in Las Vegas. In May 1970, Sinatra performed in London's Royal Festival Hall with the Basie orchestra, in a charity benefit for the National Society for the Prevention of Cruelty to Children. Sinatra later said of this concert "I have a funny feeling that those two nights could have been my finest hour, really. It went so well; it was so thrilling and exciting". Basie also recorded with Tony Bennett in the early 1960s--their albums together included the live recording at Las Vegas and Strike Up the Band, a studio album. Basie also toured with Bennett, including a date at Carnegie Hall. Other notable recordings were with Sammy Davis, Jr., Bing Crosby, and Sarah Vaughan. One of Basie's biggest regrets was never recording with Louis Armstrong, though they shared the same bill several times. In 1968 Basie and his Band recorded an album with Jackie Wilson entitled "Manufacturers of Soul". 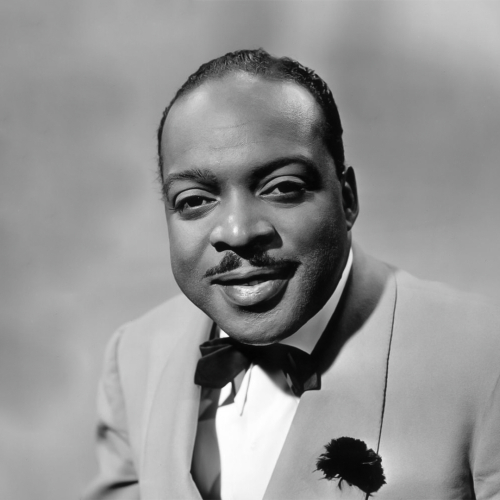 Legacy and honors edit: Count Basie introduced several generations of listeners to the Big Band sound and left an influential catalog. Basie is remembered by many who worked for him as being considerate of musicians and their opinions, modest, relaxed, fun-loving, dryly witty, and always enthusiastic about his music. In his autobiography, he wrote, "I think the band can really swing when it swings easy, when it can just play along like you are cutting butter." In Red Bank, New Jersey, the Count Basie Theatre, a property on Monmouth Street redeveloped for live performances, and Count Basie Field were named in his honor., Mechanic Street, where he grew up with his family, has the honorary title of Count Basie Way., In 2009, Edgecombe Avenue and 160th Street in Washington Heights, Manhattan, were renamed as Paul Robeson Boulevard and Count Basie Place. The corner is the location of 555 Edgecombe Avenue, also known as the Paul Robeson Home, a National Historic Landmark where Count Basie had also lived., Representation in other media edit: Jerry Lewis used "Blues in Hoss' Flat" from Basie's Chairman of the Board album, as the basis for his own "Chairman of the Board" routine in the movie The Errand Boy., "Blues in Hoss' Flat," composed by Basie band member Frank Foster, was used by the radio DJ Al "Jazzbeaux" Collins as his theme song in San Francisco and New York., In Home Alone 2: Lost in New York (1992), Brenda Fricker's "Pigeon Lady" character claims to have heard Basie in Carnegie Hall., Drummer Neil Peart of the Canadian rock band Rush recorded a version of "One O'Clock Jump" with the Buddy Rich Big Band, and has used it at the end of his drum solos on the 2002 Vapor Trails Tour and Rush's 30th Anniversary Tour. I'm Gonna Sit Right Down And..